As we first announced in our inaugral issue of our newsletter, Mission Critical Update, we will be holding free 30 minute webinars every other month starting in April. The first one will be on Wednesday, April 24 at 11AM Eastern/8AM Pacific/3PM GMT. We will send out details on how to join as the webinar gets closer. Each of these areas is a moving target. Strong organizations embrace change with well thought out plans and make the most of it with the support of management. With all of that in place, the disruptions to the business are minimized. Want to be that type of organization? 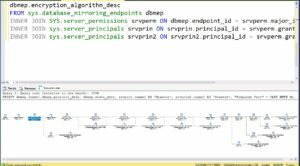 Sign up for this free 30 minute webinar from SQLHA® to hear mission critical experts Allan Hirt and Max Myrick talk about the effect of change and how to stay on top of it. You will also get a sample high level plan to see how all of this can be achieved. Want to get notified of upcoming webinars? Don’t want to miss an issue of Mission Critical Update? Looking for the latest on training and need to know when a Mission Critical Moment is published? Subscribe today and choose what you would like to hear from us. Mission Critical Update #2 is going out later this week – don’t miss out! Happy Friday. Things are finally calming down over here at SQLHA HQ. 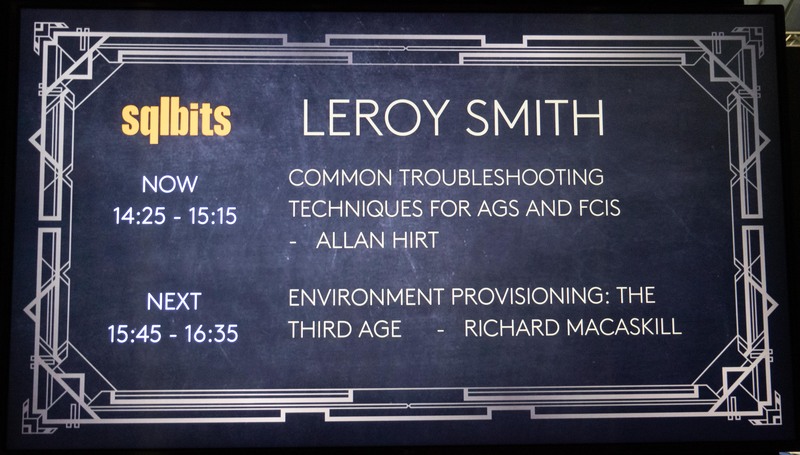 Last week I was in the UK at SQLBits 2019 where I delivered a Training Day on Thursday, February 28 and a regular session on Friday, March 1. I’ve always loved hopping across the pond to speak at Bits; it’s one of my favorite conferences. The atmosphere is always great, and the organizers do such a good job. It also doesn’t hurt that I love going to the UK. It was my first time in Manchester. Unfortunately I didn’t get much time to explore. I arrived in London on Monday night and took the train up to Manchester on Tuesday. I spent the next two days working (the inside of my hotel room was lovely), did the Training Day, my session, and headed back down to London before flying home. The Bits venue was really lovely – it was in the old (and converted) Manchester Central train station. I’m a train guy, so it thrilled me to no end. You can see it in the picture later in this blog post. The Training Day went smoothly – I had nearly a full room. I never take it for granted that after all these years and conferences around the world, people still want to show up and hear me speak. So thank you one and all who came out to the Training Day which was not free. I know you have a lot of choice, and am honored that you selected me. SQLBits this year made the decision to have 50 minute sessions. 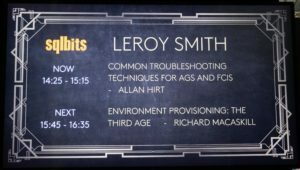 Anything under an hour can be … challenging, but I felt really good about my regular session “Common Troubleshooting Techniques for AGs and FCIs”. The Bits team already has the session uploaded, so feel free to view it at the link above. The audience was great, and I had a bunch of questions after. Luckily it was break time so people could ask me as I was tearing down. I also wanted to get off the stage quickly so the next presenters could get set up. I’m considerate like that! I hope to be able to go back in 2020, but if you ever get the chance, I highly recommoend attending at least one SQLBits conference in your career. Getting home was a bit of an adventure. There was snow back home in MA, and for the first time in a long time, I did not fly direct from London. I went via JFK. My flight from JFK to Boston was cancelled, so I wound up staying the night in New York City and taking Amtrak home. It was not that big of a deal, and as someone who is on the road a lot, par for the course. These things happen. ProTip: if this happens to you, be nice to agents at the airport or on the phone. They’re having a crappy/stressful day, too, since they’re dealing with everyone else who is being affected. You get more with honey than vinegar. The Training Day featured an all new lab that I put together, and was the first time in a few years I’ve done a Training Day with a lab. If you’re wondering why I sometimes have preconference sessions (nee Training Day in Bits-speak) without labs. 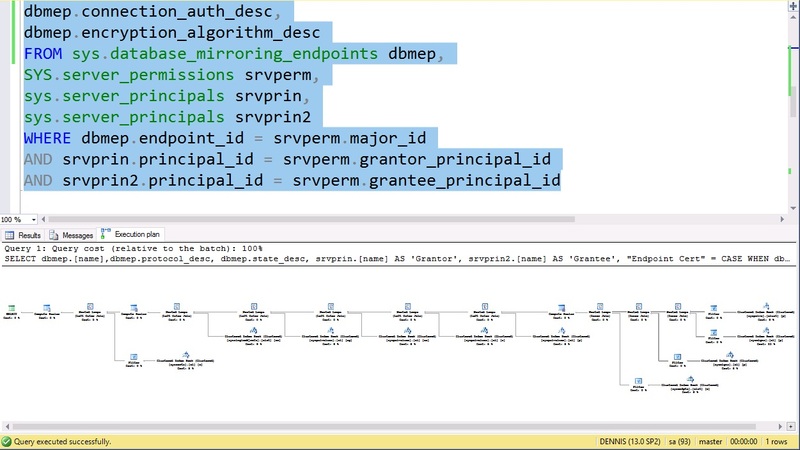 I was one of the first (if not the first) to pioneer the use of labs on this scale in the SQL Server community, and it’s nice to see some others doing it now, but it’s never a slam dunk. Why? First, before I even think of putting a lab together, I work with the conference organizers to see if the venue can support approximately up to 100 people doing labs. Since that may pepole banging on WiFi will consume a lot of bandwith, it would be a miserable experience for all involved (including yours truly) if connectivity sucked. Second is the cost involved. There’s a cost associated with each student not only for the backend lab stuff, but also to the conference organizers for the bandwidth. If it’s not going to ultimately be too expensive, we won’t do it. Nobody is in the business of losing their shirts on these things. It’s much more economical now than the first time I did this at Bits and Summit five or six years ago. Assuming the cost and the infrastructure is there, is it worth doing a lab? Let me say this: when others have said that labs were a lot of work and not worth it (some of whom have changed their minds since …), I did them. I’ve always believed in the power of hands on learning. I did labs for private and public classes when I had to bring (or send) an external hard drive with VMs and load them onto PCs with hours and hours of setup. That does not scale for so many reasons, not the least of which is the size of laptop needed to do my labs that way isn’t a low end spec. I think back to some of the classes I delivered in Australia where I arrived days earlier, had to load PCs up, test them, etc. Doing labs was, and still is, a big commitment. For the past 5 or 6 (maybe 7?) years, my labs have been done through a browser. Everyone still gets their own set of virtual machines, but they no longer need to be loaded on everyone’s PC and use a hypervisor locally. Soon I’ll be offering Azure- and AWS-based labs in addition to VM-based ones for my classes and possibly precons … stay tuned! 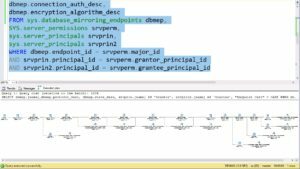 There’s the whole instructional design part of this which is putting together the VMs (and getting them all to the right point …) as well as writing the lab manual. For one day of training, it’s hard to get a lab that works in 60 – 90 minutes knowing people are at different skill levels, but you want to do something that’s meaningful and not just “click-click-click you built something but you didn’t learn anything”. Needless to say, labs were and still are a big time investment on my end, and I feel they are worth the effort. It’s gratifying to see people loving them as they are working their way through. Finally, with a one day class, you have to balance instructional content to put a lab in, so you need to design that part of the day even better since you’re giving up roughly 25% of your time to give that hands on experience. 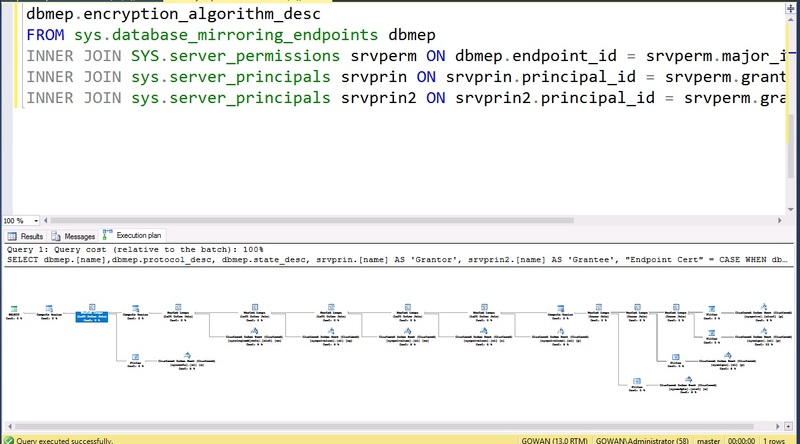 I will say after all these years, it never gets old watching a ton of people all access VMs (across 100 people it’s easily 400 VMs or more) simultaneously. That’s a lot of horsepower, and also why I need to know well in advance if it’s going to happen because the folks running the backend need to ensure there’s enough horsepower reserved for the day. It’s not just “show up and run labs”. I’m pleased to announce that yesterday I was re-awarded vExpert for 2019. Like people showing up for things like the SQLBits Training Day, I never assume that being renewed is automatic. Thank you, VMware!